Today I found out where the word “mouse” comes from. “Mouse” comes from the Sanskrit word for mouse, “musuka”, which in turn derives from the Sanskrit “mus” meaning “thief” or “robber”, presumably referring to the fact that mice like to steal food from humans, particularly grains and fruits. The Ancient Romans then used the word “mus” to refer to rodents and would distinguish between mice and rats only by “big” and “little” (“Mus Maximus”, big mouse, and “Mus Minimus”, little mouse). The word “mouse” eventually was adopted to refer to a computer pointing device in the 1960s, with the first documented instance of this being in Bill English’s 1965 “Computer-Aided Display Control” publication. Two years previous to this publication, English had assisted Douglas Engelbart in creating a computer pointing device invented by Engelbart. Engelbart and English named this pointing device a “mouse” because the original device had the cord coming out of the back of the mouse, which they thought resembled a tail. In addition to naming the device a mouse, they also named the cursor a “bug”, but this latter name for a cursor never caught on like “mouse” did for the device itself. Among other diseases, mice are known to spread: salmonellosis, rickettsial pox, lymphocytic choriomeningitis, leptospirosis, ratbite fever, tularemia, dermatitis, murine typhus, and hantavirus, the latter of which requires only breathing dust that has come in contact with mouse excrement. In Ancient Egypt, cooked mice were thought to treat smallpox, whooping cough, measles, among other health related problems. In addition to that, the noted Roman Pliny the Elder recommended using mouse ashes mixed with honey to cure certain ear problems. Mouse urine glows under florescent light. Mice are thought to have originated in Asia then gradually spread through Europe and then to the Americas via stowing away on sailing vessels. 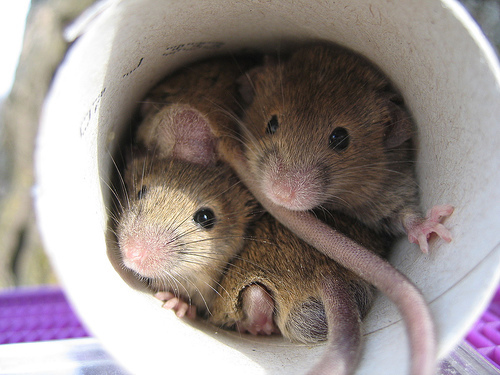 Mice re-produce very rapidly, beginning breeding at around two months old and being able to produce around 6-10 litters per year with about 5-10 baby mice per litter. Mice are generally considered to be herbivores, due to their preference for eating grains, fruits, and the like. However, most mice will and can eat just about anything they encounter, including their own feces. Despite their propensity to spread disease and the like, surprisingly, mice are very clean animals. They clean themselves regularly, not unlike cats, and they organize their homes with specific areas for storing food, going to the bathroom, sleeping, etc. Despite how much they hate jumping from high places, mice can actually jump from as high as 12 feet without any injury. Amazingly, some mice can also jump as high as one foot vertically. White mice were often kept under the altars in Apollo’s temples in Ancient Greece. Apollo himself was often referred to as “Apollo Smintheus”, meaning “Apollo the Mouse”. Rodents can be found pretty much everywhere in the world, including Antarctica. The Hindu god Ganesha is often depicted riding a mouse. Unlike rats, mice tend to forage for food very close to their homes. Typically, the mice will not travel more than 10-25 feet from their home to look for food. So if you see a mouse in your house, odds are their home is very close by. Rodents cause around one billion dollars worth of damage every year in the United States alone. They are particularly notorious for commercial crop destruction and chewing electrical lines, which tends to cause equipment malfunctions and creates a fire hazard. Like most rodents, mice cannot vomit. The first known mice to be kept as pets goes all the way back to 1100 B.C. in China. Walt Disney originally did the voice for Mickey Mouse. Mickey Mouse was introduced as a replacement character for Disney’s “Lucky Rabbit” character. Mickey Mouse’s original name was to be “Mortimer Mouse”, but it was later changed at the behest of the creator of the character, Ub Iwerk’s, wife. The name “Mickey Mouse” can also be used as an adjective meaning “small, worthless, trivial, or counterfeit”. It was first used as “small/worthless” around 1936, eight years after the cartoon mouse character was created. In the cartoon “Pinky and the Brain”, Brain’s name is an acronym for “Biological Recombinant Algorithmic Intelligence Nexus”. Pinky’s name is probably a reference to the fact that a “pinky” is another name for a baby mouse that has not yet grown fur. However, in the cartoon itself, the name was given to Pinky when Brain was referring to his own pinky when insulting certain scientists, but Pinky mistakenly thought Brain was referring to him. Besides “pinky”, other valid names for baby mice are pup and kitten. Continuing on the theme of calling mice by names generally associated with other species, male mice are known as bucks and female mice are known as does. 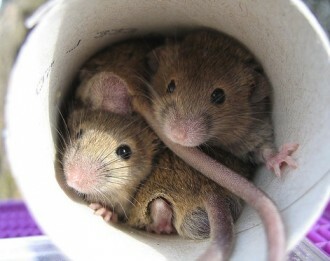 According to the Oxford Dictionary, both “mouses” and “mice” are valid terms for referring to more than one computer mouse. Engelbart never received any royalties for inventing the mouse. Although many computer systems throughout the 1970s used some form of a mouse, the mouse was not popular until the 1984 release of the Apple Macintosh. In Spanish mouse is “ratón” or “rata” and in popular meaning both mean thief. He is a thief: Él es un rata o ratero. Where did the etymological info in this article even come from? Mouse is derived from Proto-germanic *mus, which in turn was derived from Proto-Indo-European *mus, from which the Sanskrit for mouse also derives. It’s much simpler explanation that the root for mouse has simply descended from PIE than that it has been borrowed repeatedly from Sanskrit. @Lulu: Check the references at the bottom of the article. Actually, “mouse” does not “come from” Sanskrit, English “mouse” and Sanskrit “mus” share a common root, “mus”, in Proto-Indo-European. Leaving poison for rats to eat is never a good solution, as is also suggested in this article. It is a cruel and cowardly way to deal with a problem.